With boats away competing in Cork Week and others on holiday the penultimate race of the Summer Series was poorly supported, however unsurprisingly all the boats in contention for the podium places were racing and the results set up a grand stand finish in both classes in the final race next week. Tinker T the SOOD set a course of a beat with the tide to Browndown, a fetch to NE Ryde Middle and a run home. With only 5 boats on the pitch the starts were reduced to one only. The fleet stacked up on port got away cleanly and soon Sunshine with her greater pace eased ahead. The Sigma 33's surprisingly split tacks, with Happy Apple opting for a hitch into Stokes Bay whilst Spirit of Kudu went left into the fierce west going tide and possibly a little more breeze. 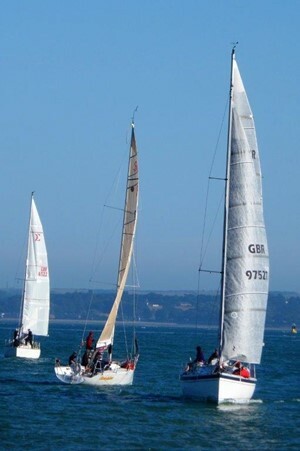 At the windward mark Sunshine rounded well clear of Tinker T, Spirit of Kudu then Happy Apple whose punt into Stokes Bay clearly had not worked. The run home from NE Ryde Middle against a raging tide was painfully slow but commercial traffic down the North Channel kept the fleet focussed as they headed into Stokes Bay to take advantage of the established Gilkicker tidal back eddy. With Sunshine holding her time on handicap the series chocolates in IRC will be between Happy Apple and Sunshine whilst in NHC it will be a 3 way battle between Sunshine and both Sigma 33's. Bring it on!